This is a semi-professional chamber orchestra of about 32 regular players. 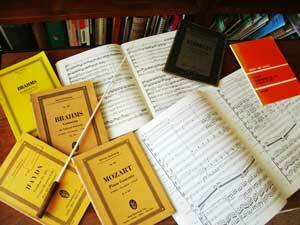 We specialise in baroque and classical repertoire mainly, together with more modern works for smaller orchestras. We rehearse on Fridays 7.30-9.30 for about six weeks up to a concert. The rehearsals are held in The Friends' Meeting House (see Venues). Strings are invariably needed every week but wind, brass and percussion only as required. There are vacancies at present for violins and violas particularly. Standard - we rehearse intensively up to a concert. Some of the players are instrumental teachers and many belong to other orchestras so their time is precious. You will have a fairly shrewd idea of whether you can cope or not, and we will be delighted to see you on a Friday evening for a 'taster' rehearsal - no obligation and a free cup of tea in the break! If you would like to follow this up, please e-mail Teresa Crick.